In the Peloponnesus region of southern Greece there is a small village called Pavlopetri, where a nearby ancient city dating back 5,000 years resides. 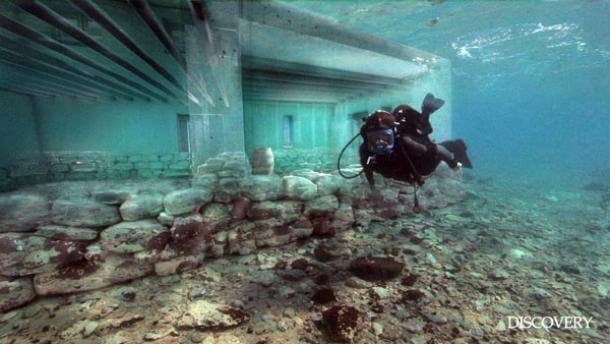 However, this is not an ordinary archaeological site – the city can be found about 4 meters underwater and is believed to be the oldest known submerged city in the world. The city is incredibly well designed with roads, two storey houses with gardens, temples, a cemetery, and a complex water management system including channels and water pipes. In the centre of the city, was a square or plaza measuring about 40×20 meters and most of the buildings have been found with up to 12 rooms inside. The design of this city surpasses the design of many cities today. The city is so old that it existed in the period that the famed ancient Greek epic poem ‘Iliad’ was set in. Research in 2009 revealed that the site extends for about 9 acres and evidence shows that it had been inhabited prior to 2800 BC. Scientists estimate that the city was sunk in around 1000 BC due to earthquakes that shifted the land. However, despite this and even after 5,000 years, the arrangement of the city is still clearly visible and at least 15 buildings have been found. The city’s arrangement is so clear that the head of the archaeological team, John Henderson of the University of Nottingham, and his team, have been able to create what they believe is an extremely accurate 3D reconstruction of the city, which can be viewed in the videos below. Historians believe that the ancient city had been a centre for commerce for the Minoan Civilization and the Mycenaean civilization. Scattered all over the place there are large storage containers made from clay, statues, everyday tools and other artefacts. The name of the city is currently unknown as well as its exact role in the ancient world. The featured image shows the original foundations of the city behind underneath the reconstructed pillars and walls of one of the buildings.